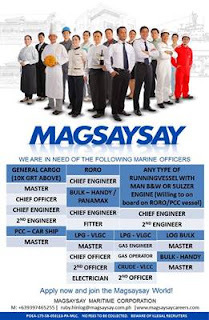 SEAMAN JOB INFO - Posted/Jan/2019 Magsaysay Maritime Corporation updated hiring jobs position for Filipino seafarers crew join on General Cargo, RORO, Bulk Carrier, LPG, VLCC, Car Ships. 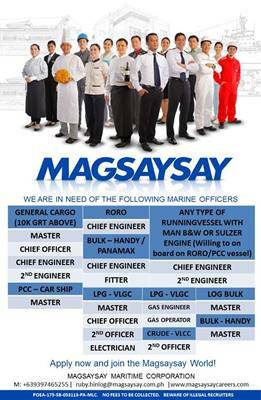 If you are one of the candidates that we are looking for, please send a private message through messenger or send your updated resume to my email ruby.hinlog@magsaysay.com.ph together with this details. 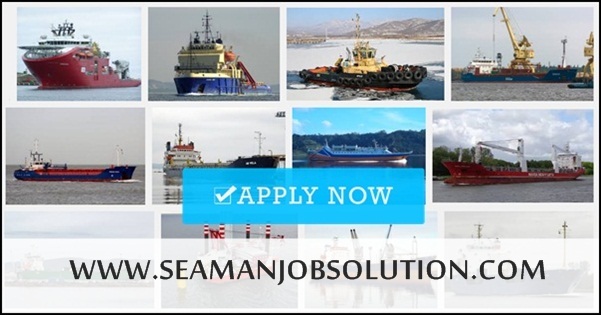 0 Response to "Hiring Crew General Cargo, RORO, Bulk Carrier, LPG, VLCC, Car Ships"